I have wanted to come to Bohol since I met up with friends in Brunei last year who were raving about it. It sounded like an awesome place – with tiny tarsiers, stunning scenery, great beaches and just a nice place to explore and hang out. Given how much we loved the Philippines on our first visit, it was high on my bucket list for our Asian adventure this year. It deserved this spot. Bohol is a fabulous destination. There are some fabulous Bohol attractions, just beautiful scenery and people and it’s all at a good price tag. 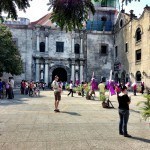 It’s also easy to get here as it’s just a short ferry ride from Cebu City, a major port of entry into the Philippines. 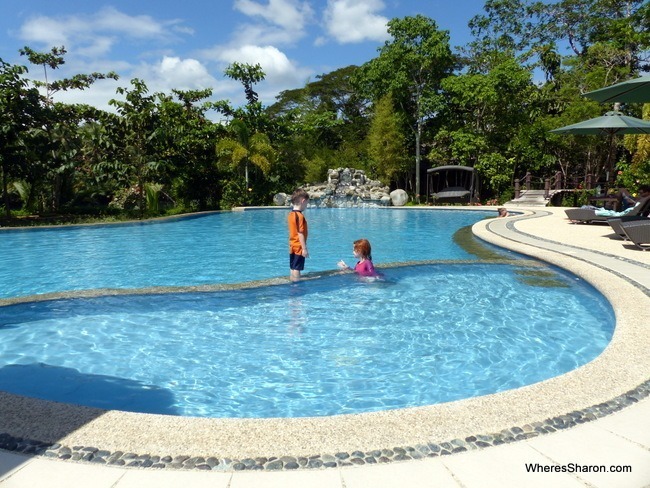 Below you will find our Bohol travel blog – this includes what to do on Bohol, visiting Bohol with kids, how to get to Bohol and get around, where to stay and everything else you need to know to have a fabulous adventure. Before I get started, though, I do want to explain something – when people talk about Bohol, they often mean Panglao Island as well. This small island is just off the coast of Bohol and connected by bridge. Many people stay on Panglao Island to explore Bohol and this is easy to do. The Bohol tourist attractions I talk about below also include attractions on Panglao Island. There are a lot of places to visit in Bohol – these are the ones that sounded most interesting to us and gave us a variety of experiences. 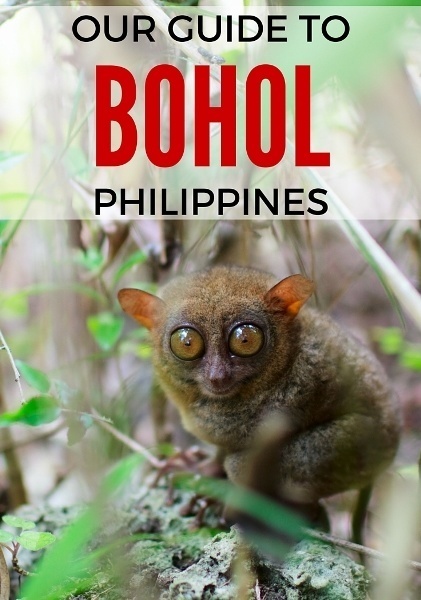 There are two must see places in Bohol – and this is one! You can’t come to Bohol and not look at a gorgeous little tarsier. Tarsiers are a small species of monkey that live in trees and are only found in some islands in the Philippines, Malaysia and Indonesia. 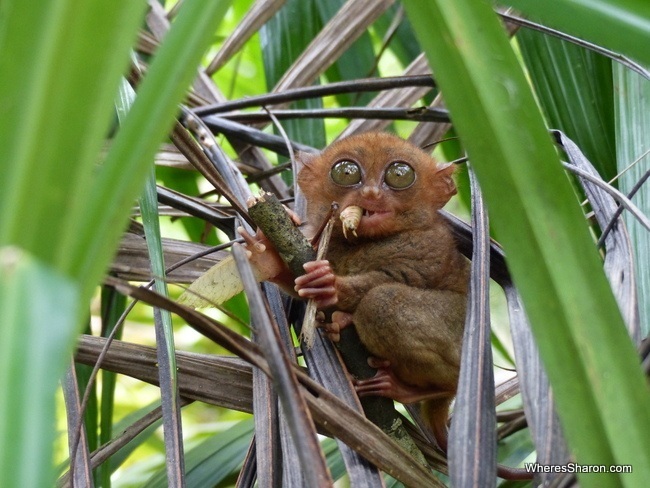 The best way to see tarsiers in the wild is at the Philippine Tarsier Sanctuary. Here, you are visiting a responsible tourism operation that cares about the conservation of tarsiers, unlike at some other places. It’s a great place. You pay the entry and then they take you in very small groups (we were with two other people) around their sanctuary to see the generally sleeping tarsiers in the trees. 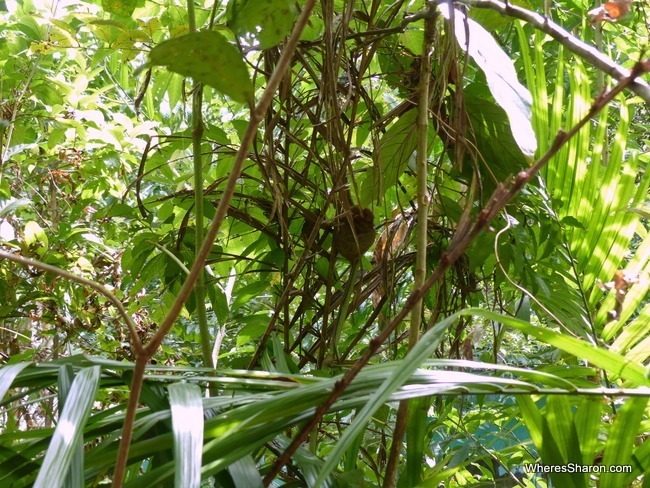 Tarsiers are nocturnal, so you are most likely to see them asleep or resting. You need to keep quiet while visiting the tarsiers. The kids were fascinated enough, and the visit was short enough, that this was no problem. There is not much walking involved and we were probably walking around and looking at tarsiers for only 15 minutes. Read more about tarisers in this article about weird animals. Entry costs 60 pesos per adult. Kids free! 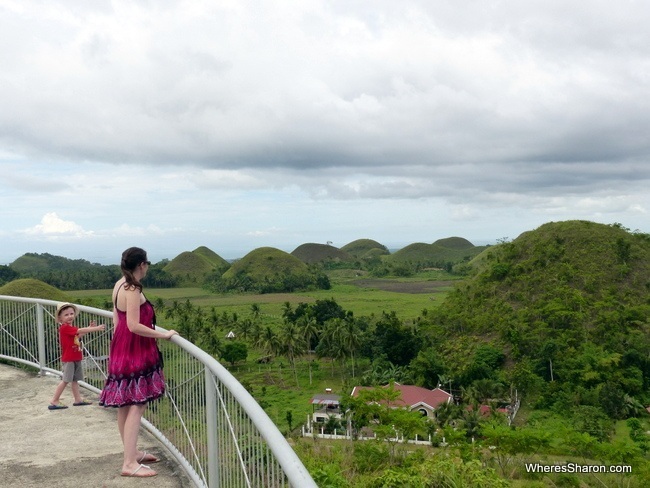 The other must see in Bohol is the Chocolate Hills. These round hills that cover part of the land in Bohol are quite a sight! The Chocolate Hills are named this because at certain times of year, they are a brown chocolately colour. This wasn’t the case when we visited (they were green) but it was still definitely worth the visit! We saw them from Sagbayan Peak (there are other viewing points) and they were seemingly everywhere. It was a great view! The drive there was awesome too as we passed many on the way. 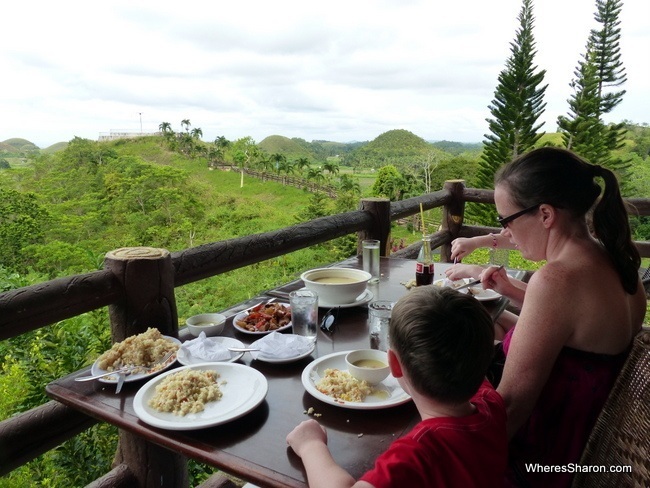 This is a great spot to view the Chocolate Hills – I also put it as a separate entry as there is a lot more to do here, especially if you are looking for things to do in Bohol with kids! Sagbayan Peak is quite a random assortment of attractions. Firstly, there is a viewing platform at the top – great views over the Chocolate Hills. There is a fabulous restaurant. We ate lunch on the balcony here surrounded by views and having one of our best local meals. There are also a couple of other shops. In addition to this, there is a kids’ playground, mini zip line (although I personally would call it a flying fox), Kidsland (which is a weird assortment of statues of famous kids’ characters and buildings that the kids can play in – set up as things like a school, castle, pizza shop), and some other random statues, like of dinosaurs! It was strangely compelling and we could have spent quite awhile here. The downside of visiting here is that it added quite a lot of money to the cost of our car and driver. We thought it was worth it though. 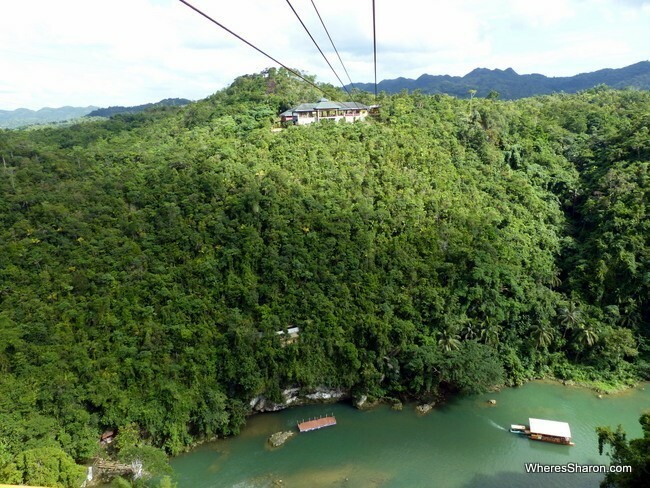 The Loboc Eco Adventure Park’s Zip Line is an awesome places to visit in Bohol if you’re after a birds eye view of the Loboc River, especially if you want to feel like a bird doing it. Here you can cross the river by zip-line in both directions. There’s two separate lines. 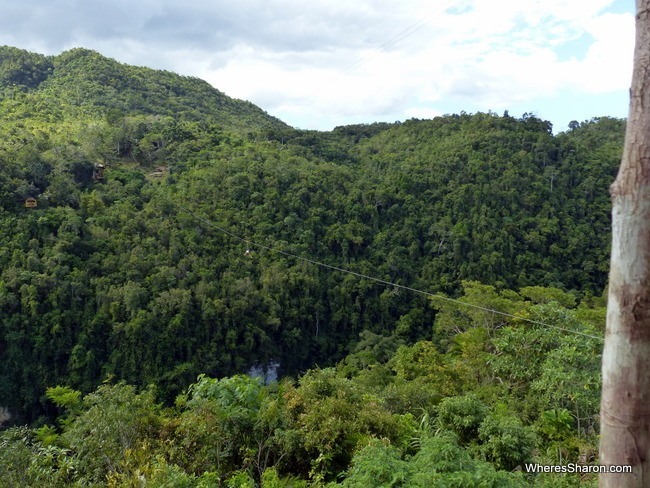 The first line is a staggering 120 metres above the river and 500 metres in length. The line back is a more modest 100 metres. There’s also a much slower chair lift which is great for kids (if they can sit still) that’s also a whopping 100m above the river. The views are fantastic. It’s a long way down and you can see the river clearly as well as get a nice view of the valley (although not too far in any direction thanks to the hills). The highlight is the zip lines. To cross you lie on your stomach in a sling and fly over like superman or a bird. If you’re wearing loose footwear they’ll ask you to take it off and will tuck it into the sling for you. It is the longest zip line I’ve been on but it does go quickly – all over in less than a minute. It is a lot of fun and you feel like a bird – well, I did anyway. You can take a zip line one way and then the chair-lift back, or vice versa. You can also zip line or chair lift in both directions. It costs 350 pesos to make one return trip (using any combination of options) or 550 pesos to do both the chair-lift return and the zip line return. 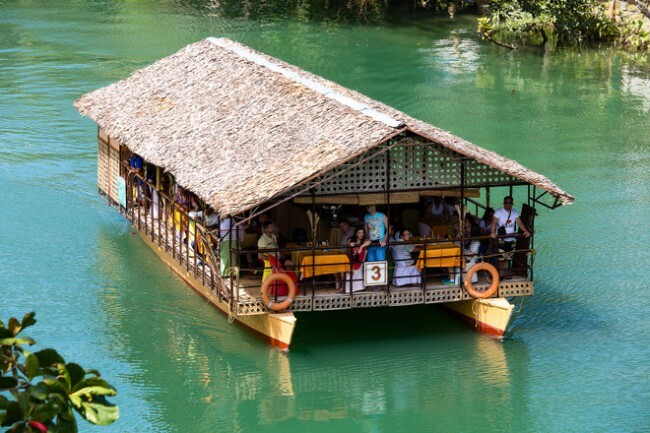 Another of the popular attractions in Bohol is to take a Loboc river cruise. There are several ways you can do this. You can take a lunch buffet cruise from Loboc town or you can hire a boat from quite a few private operators and have your own cruise. 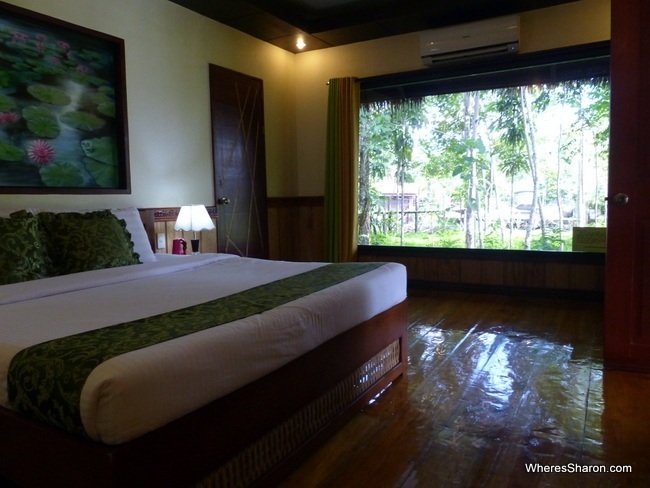 We went with the latter from the Loboc River Resort. 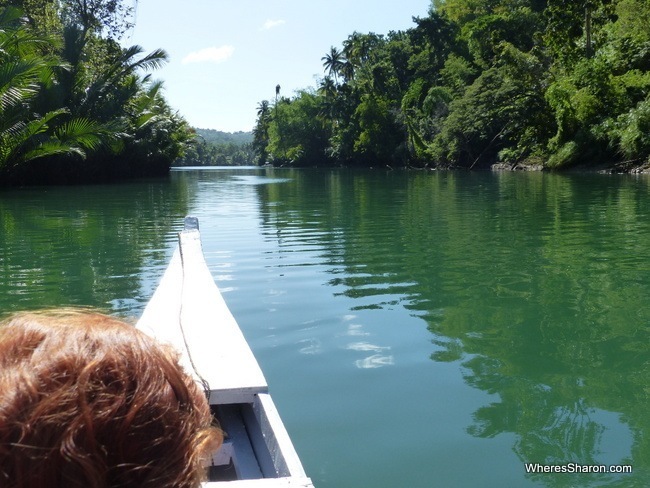 The Loboc River is a beautiful setting and this is a great way to see it. We went with a one hour hire which was more than enough for our kids and enough time to take it all in and enjoy. An hour cost us 250 pesos. It’s also possible to see fireflies around the Loboc River which was one of our favourite Bohol things to do. From the Loboc River Resort, you can do boat tours to see the fireflies which we were told by other guests are spectacular. You don’t have to be a guest of the resort to do this (although you will get a discount). It is not recommended for young kids, but we were able to view them around our resort. We were lucky enough that there were many crowded around our balcony in the evenings. Just magical! If you want to have a spectacular jungle experience in Bohol then I can’t recommend the Loboc River Resort enough. There are many activities to do which are included or just a small extra fee. We found this resort accidentally when we had a last minute schedule change and I am so happy we did. We were initially seduced the beautiful looking river suites situated over the river, and these suites are fabulous, but the real win is the beautiful surroundings and all the activities on offer. It’s perfect for anyone and we found it a fabulous way to easily have some new experiences with our young kids. There is more about this resort below or you can check out the latest prices here. 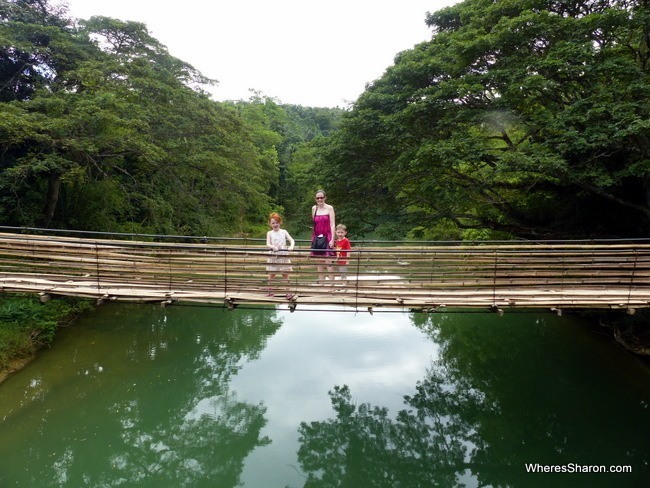 Another of the places to go in Bohol is the Sipatan Twin Hanging Bridges. Located just outside of Loboc, these are two hanging bridges over the Loboc river that you can walk over. The views are nice and the bridge does rock a fair bit – I wouldn’t want to take kids on it if there were other people walking on it at the same time. It has become quite a tourist attraction with many people visiting and some souvenir stalls and coconut stands. It actually took longer than I expected to get here, even though we were staying in Loboc. We probably spent less than 5 minutes here, and I couldn’t help but feel our time would have been better spent elsewhere. Of course, we had just spent a couple of days staying on the Loboc River so the views were less spectacular for us. If you are looking for something to leave out, this would be the one I would pick. It costs 20 pesos for adults to cross over. 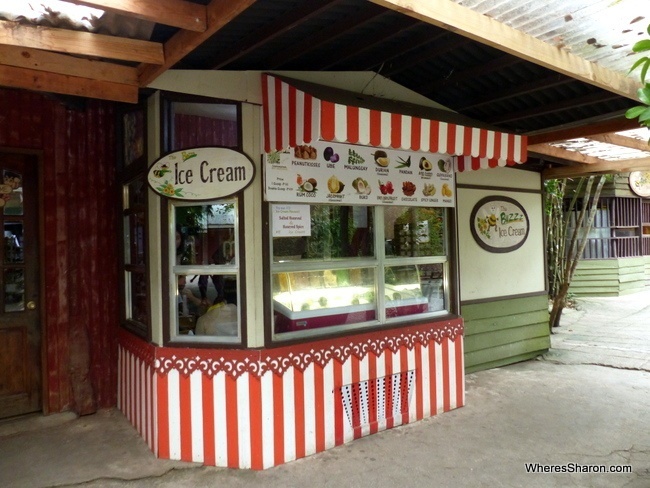 Another place to visit in Bohol over on Panglao Island is the Bohol Bee Farm. 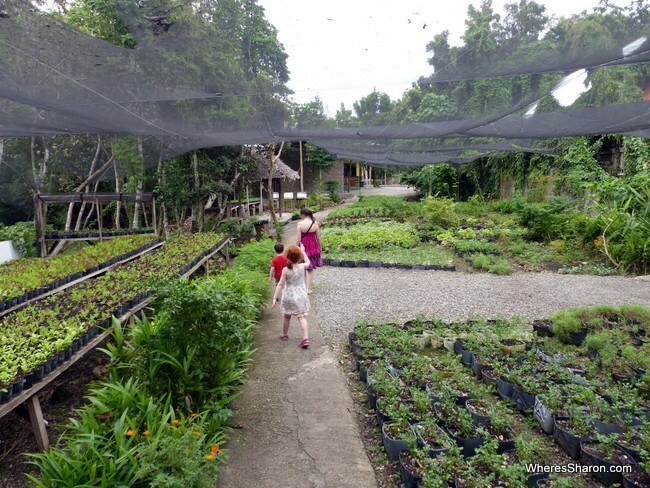 It is about 15 minutes drive from Alona Beach and it has quite a set up – there is the organic farm, bees, a restaurant, a beautiful shop (selling some of the best ice cream ever) and a craft area. There are half hourly tours of the farm and their operations and you can also take a wander. Don’t leave without tasting the ice cream! Thankfully they also have an ice cream stand just off Alona Beach. You can’t come to the Philippines without visiting a beach and one of the other things to see in Bohol is over on Panglao Island at Alona Beach. I must admit though that I was completely underwhelmed by this beach. I had expected something much nicer. There is not much sand and A LOT of boats. They thankfully weren’t loud boats, like in Ao Nang and Railay where they ruined the beach for us, but they did stop us enjoying the water. It didn’t feel like we could do more than wade. I had read you could swim out to the coral 75 metres from the beach, but that would not have been safe. There was also trash in the water. The most annoying part was not much sand on the beach. The kids wanted to build sandcastles and really the only place to do this was in the outdoor parts of the restaurants where I assume they had moved some of the sand to better place their tables so there was some build up. It was still quite pathetic. On the upside, we felt the beach area had a nice vibe – there is a beach path lining it lined with hotels, restaurants etc, although it is only a small area. Strangely, we found prices for restaurants along the beach better than the roads around it! Everything is more expensive than elsewhere though. Even shops are pricey. We had a kitchen but found it expensive to even buy simple food to serve ourselves. We did enjoy staying in this area though – it’s nice and easy and relaxed. I just wished I had realised the beach would be such a disappointment. It is not comparable at all to Boracay. I’ve read that Dumaluan Beach nearby can be a nicer place to go if you want some beach time or head to White Beach near Moalboal on Cebu. Confession time. We did not go diving or snorkeling during our visit to Bohol and Panglao Islands. Given I stayed in the Alona Beach area alone with the kids while Josh went to Japan, this just wasn’t an option for us. However, it is meant to be awesome. There are many diving and snorkeling trips offered around Alona Beach and you will not have problems at all finding someone to take you out. Bohol is an excellent place to visit as a family – we went with our three and five year olds and I was also pregnant. 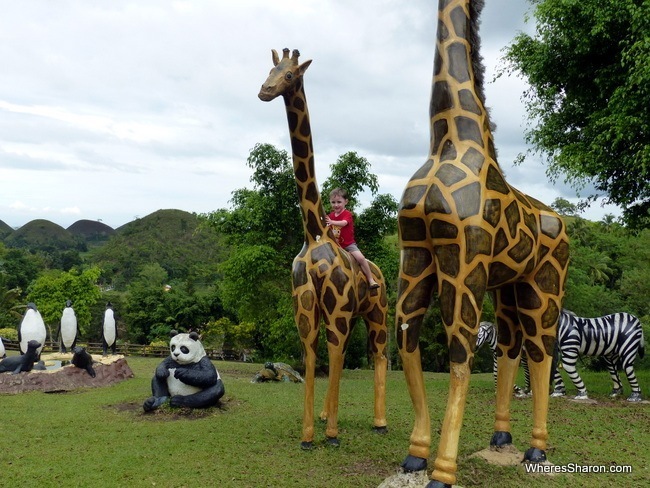 There are tons of activities and places to see in Bohol for kids, primarily because the focus is on the outdoors which I find always works very well! 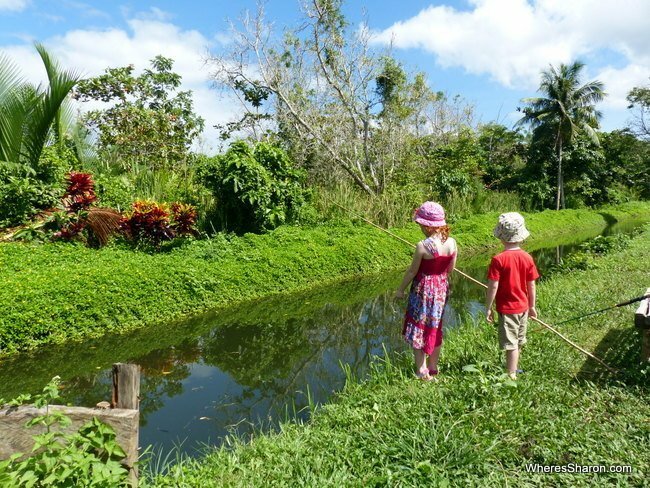 The Loboc River Resort particularly worked well for us as it made it ultra easy to have different, fun experiences with the kids for free or a very low cost. 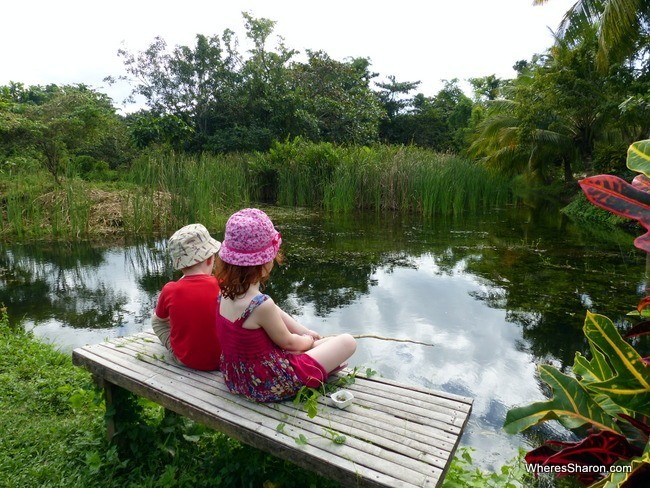 They also particularly enjoyed all the kid things to do at Sagbayan Peak and seeing the tarsiers. I definitely strongly recommend spending a few nights on Bohol itself, preferably inland somewhere like the beautiful Loboc River Resort. We really had such a sensational time here and it is much more central to attractions than the more popular Panglao Island. However, there is something convenient about being in a tourist town and we did enjoy our time in Alona. The problem for me was that it was just nice enough. If you are looking for a more beachy destination in the Philippines I would definitely pick Boracay or Roxas over here and there are many more places that sound even better. If you do want somewhere that’s an easy jumping off option for Bohol attractions with lots of eating options then Alona is a winner. This resort is just brilliant and in addition to all the great things to do that I mentioned above, we had a fabulous suite. We stayed in a river view suite. These are very spacious with a living area with kitchenette, a big air conditioned bedroom with king size bed and a fantastic balcony with seats and views. We stayed in suite 1 which I would definitely recommend as we also had great views from our bedroom and the fireflies seemed to particularly like our balcony at night. In the wet season, I believe that there would have been water underneath and surrounding us, but when we visited in December, we were next to the river instead. There is wifi and a great restaurant. We were very happy with how great the food was and how reasonably priced it was too. There are tons of activities and these were free or cheap. You can also organise day trips of the island and these were reasonably priced too as long as you wanted to do the standard itinerary. If you want to do something a bit different, then I recommend organising a car before you arrive as this became expensive. We had a fabulous stay here. It is just such a beautiful setting, and we could have stayed so much longer. The staff are also super friendly and remembered our names and made sure our stay was going well. Just to be transparent, they did not know we were bloggers and we have no commercial relationship with this resort so none of this was special treatment because of that. We paid about AUD$140 a night. Click here to see the latest prices. Alona is expensive and this was the best mid range price option we could find. It was perfect for a family however. We had a great family suite which had a queen size bed in a separate bedroom, a king size bed and a basic kitchen – it came with fridge and freezer, a stove top, a frying pan, big saucepan and cutlery and crockery. Given how sick I had been, it was great for us to have the option to self cater especially as I spent most of my time in Alona without J – he headed to Japan for a few days and I stayed with the kids. There is also a lovely pool at the hotel, a bar and a restaurant. They only advertise wifi in common areas but we had it from areas in our room – thankfully where the beds were positioned which was convenient! The downside is that it is about a 15 minute walk from the beach. The rickshaws are very cheap though and there are plenty of restaurants closer. We paid about AUD$122 a night for a family suite. Click here to see the latest prices. 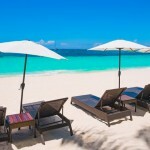 Henann Beach Resort – This big resort near Alona Beach is in a great location if you want to be in the centre of things while still staying in a lovely resort that has everything you need – including a crazy amount of swimming pools! There are a variety of room types including family rooms. Click here for the latest prices. Bohol Beach Club Resort – A beautiful resort near a gorgeous beach on Panglao. This is the place to be if you want to be in beautiful surrounds away from the action. There are many things to do and some great facilities. Click here for the latest prices. TipTop Hotel – This is a solid budget choice with a pool just 200 metres from Alona Beach. There are a range of room types including quad rooms which would suit a family. Click here for the latest prices. 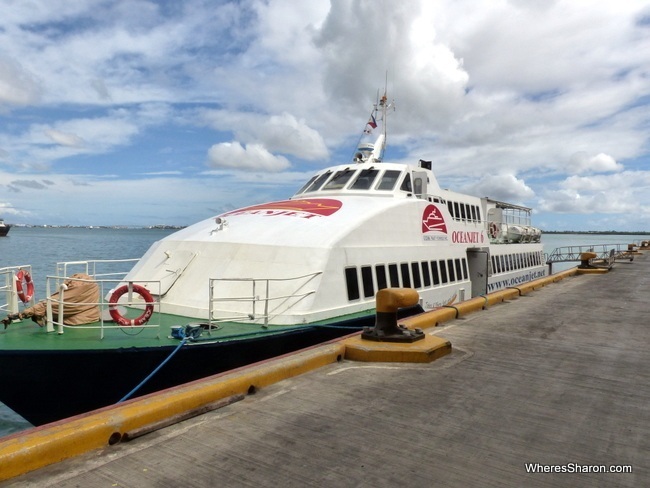 You can fly or ferry over to Bohol island. Oceanjet has the most crossings and is fast and efficient at only 2 hours from Cebu to Tagbilaran. You need to buy tickets and check in at least half an hour in advance. It’s a three step process – buying the tickets, checking in (you will be assigned seats) and then paying a port fee. If you have bigger bags, you need to check them in as well at a different desk. This also has a fee. When entering the terminal building, luggage is scanned and you need to walk through a metal detector. It’s lots of steps and can seem like a lot but we found it all very easy, fast and efficient. The ferry rides were also ultra easy. No problems. 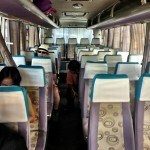 They do play a movie on board at the front so this may affect where you want to sit. They are not always little kid friendly. The Cebu terminal is big with a few different shops selling food, drinks and souvenirs as well as a toddler play area. The Tagbilaran one is much smaller with just a small food and drink stall. It’s also possible to fly in (we actually had flights booked but then our plans changed). Read more in our guide to Cebu City. Ferry from Cebu on Oceanjet was 500 pesos for adults and 400 for kids. It was cheaper than what was listed on their website strangely. There are jeepneys and buses, but if you are planning to see much, you are going to want to hire a motor bike or driver and car for at least a day. There is also the option of small group tours – they are sold everywhere in Alona. For us, a car was the only answer. It was great to have the freedom to explore at our own pace and making our own itinerary and essential with young kids. This is simple to organise. Again, there are many places to do this as well as through your hotel. Negotiate everything in advance – like exactly where you want to go. We tried to do a half day one day but it was going to cost as much as a full day, so this is something to keep in mind. The distances also take longer than you might imagine to travel. We thought we would have about an hour of driving on our day tour – we were so wrong! Just Sagbayan Peak to Alona beach was over an hour an a half. It was an hour to this peak from the tarsiers. It all really adds up and it’s something to keep in mind. A day with a driver seems to start at about 2000 pesos – as long as you want to go the typical route. Otherwise you are looking at more. 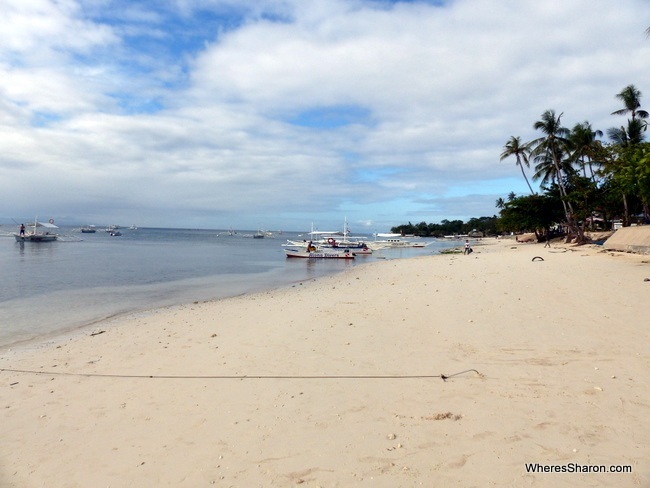 We spent 6 nights on Bohol/Panglao Island which is a great length of time. 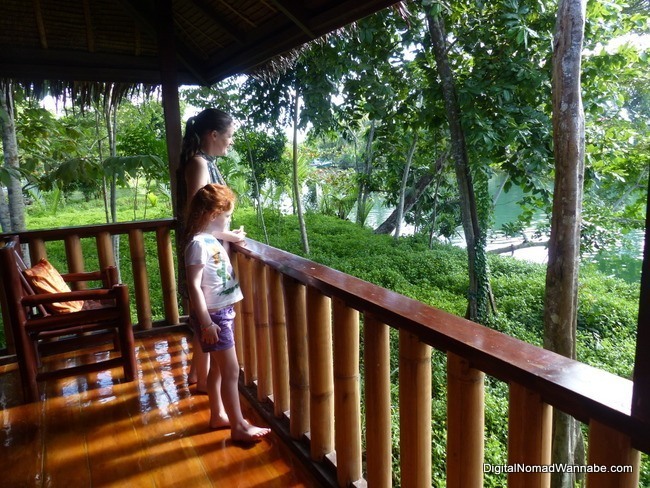 We spent the first two nights at Loboc River Resort and then 4 nights at the Alona Northland Resort – I wish I had split it up 3 and 3. We took it much easier at the end than the beginning because J headed off to Japan and I was still suffering from pregnancy morning sickness, so I wanted to make my life as easy as possible with a 3 and a 5 year old. I am glad we did it this way anyway. It was nice to have a few days to chill at the end without sightseeing pressure and for people who are able to go snorkeling and diving, there’s your time. Day 1: Arrived in Tagbilaran around lunch time. Went straight to Loboc River Resort where we walked around and attended some of the activities. Day 2: Morning and late afternoon doing activities at Loboc River Resort (including boat ride). Early afternoon was spent at ziplining. Day 3: Day tour with driver visiting the Philippine Tarsier Sanctuary, Sagbayan Peak and bamboo hanging bridges. 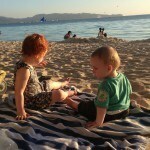 Dinner on Alona Beach (also J’s birthday!). Day 4: Alona Beach in the morning. Hotel pool in the afternoon. Day 5: Bohol Bee Farm and taking it easy. There is only one verdict I can give Bohol – I love it! This place truly is magical. 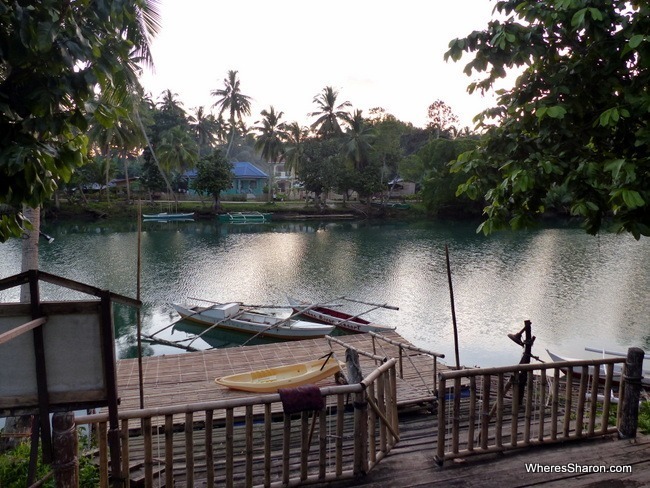 We loved our time here, especially around Loboc. 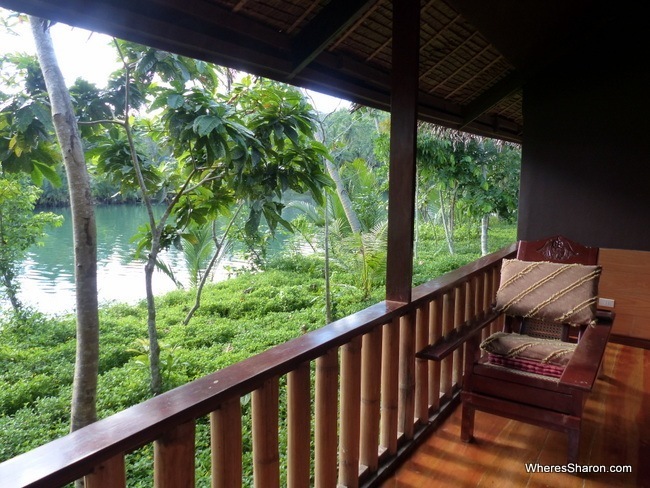 The Loboc River Resort was just heavenly and so perfect for us. We also loved most of the places we visited – the tarsiers, the Chocolate Hills and being on the Loboc River were the highlights. 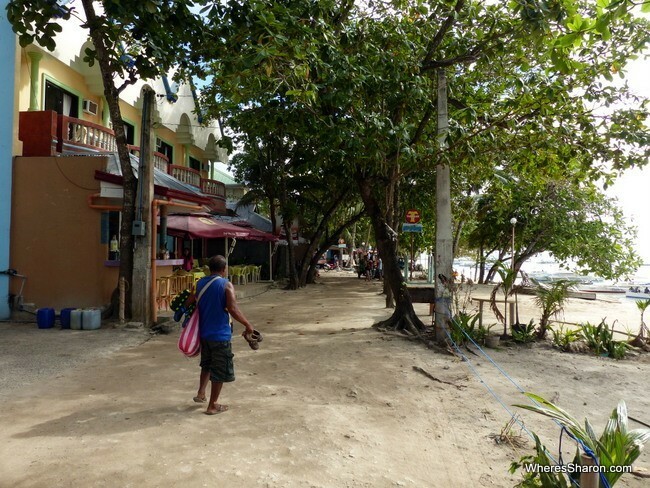 We were less impressed with Alona Beach, but it is a nice, easy place to base yourself. All in all, Bohol is an excellent holiday destination, whether you are travelling alone, as a couple, with friends or seeing Bohol with kids like us. Yet again, this taste of the Philippines has us wanting more. 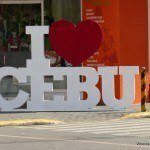 Read more about our adventures in the Philippines and our guide to Cebu City. Disclaimer: This article contains some affiliate links. If you make a purchase after clicking on one of these links, we may receive a small commission at no extra cost to you. Awesome write up ,heading over to Cebu can’t wait to try your suggestions with wife and Master 4. Hi Sharon, great blog. Just wondering if we need a special drivers licence if we hire a car for the day? And how safe/easy is it to drive round Bohol for tourists? Am guessing our travel insurance is the only insurance we need? Or? We are first timers to the Phillipines travelling in May 2017 and we are hoping to pick and book accommodation as we go, is that such a good idea? Thanks ??? Hi Heidi! I am not sure about car hire in the Philippines as we hired a car with driver. You would need to check with your travel insurance to see what it covers. The roads looked fine and there wasn’t much traffic so I think it would be easy enough to drive around. I believe May is low season so you should be fine finding accommodation as you go. Phillipines is a great place, enjoy!! Yay, I’m glad it’s been a help. I hope you’re having an awesome trip. I’m very jealous as I sit here in cold Australia. Hi Janine! We rented a car and driver through our hotel at the Loboc River Resort. I don’t have a number. I would recommend doing it when you show up – very easy to do – or arranging through your hotel if you need someone to pick you up on arrival. Have fun! Hello Sharon, wow what a great travel website you have!!! How come I haven’t found it sooner?! Anyway it really seems great, we shall not miss this. Thanks for all your great advises!!!! No problem Anna! I especially love connecting with mums of other red heads 😀 Went went to Bohol in December last year. We went to Boracay in March in a couple of years ago. The weather was awesome and is likely to be differnt mid year. Ask if you have any other questions.